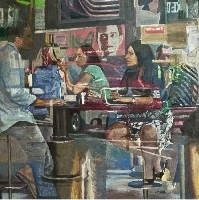 During 2014 - 2016, I have enjoyed three major commissions: a triptych painting of Grand Central Terminal during August Rush Hour for the Lobby of 4540 Center Blvd in LIC, a TF Cornerstone residential tower; a diptych painting entitled "A Possible Conversation" for the Lobby of 80 DeKalb in Brooklyn, a Forest City Ratner residential tower; and a 10' long painting of the East River Waterfront at Sunrise for the conference room of a company in LIC. In 2011, I was one of four artists representing the United States in "Nordart 2011 at Kunstwerk Carlshutte, Budelsdorf, Germany. 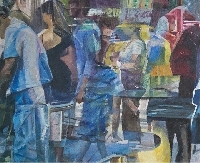 Notable solo exhibitions in the United States were at the Atlanta Art Gallery in Atlanta, Georgia, Capricorn Galleries in Bethesda, Maryland, and the DFN Gallery in New York City, all of which showed figurative work and no longer exist. I was the recipient of the Thomas B. Clarke Award for figurative painting at the National Academy of Design in New York in 1986 and the Second Place Award at the Butler Institute of American Art Midyear in 2002. I also received an NEA Grant and a NYFA fellowship during these years. In a parallel career, I have created commissioned portraits for at least 75 individuals and families in home and office settings. My paintings are in the permanent collections of the Cleveland Museum of Art and the Smithsonian American Museum in Washington, D.C., the Museum of the City of New York, and other museums, and am represented in more than 50 corporate collections and hundreds of private collections in this country and abroad. In my most recent series REFLECTIONS AND PORTENTS, which I began about 10 years ago, I am working with images that I see as I pass by bars and cafes with glass windows that reflect the images of the street; people passing by, cars and, particularly, the media from the electronic billboards, intermix with the images of the people inside and the interior spaces. Media images have become part of our immediate reality, forever cutting into the collective sense of our relationships to each other. Reflections, and motion when caught with a camera, create transparencies and multiple layers that become the building blocks from which my paintings are constructed. The layers are woven together, creating patterns that become ways of seeing the immediate world in front of us, behind us, and multiple views in between. The reflected reality is often visually indistinguishable from the physical reality, the two blending together in a flattened and collage-like way. I've included one painting here on the theme of PORTENTS. 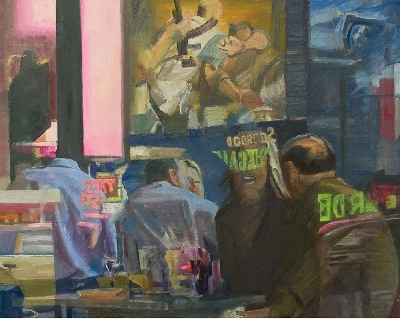 It is a painting of fragmented narrative involving men with guns that literally overlaps in both storytelling and paint. 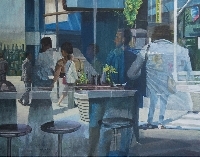 In this painting, a world of everyday activity is disturbed by a center area that hints at potential destruction, the narrative and painting coming together in a dreamlike surface dissonance.